Egbe Hospital receives a new laboratory, giving local community members better access to healthcare. Abby Anderson and her husband, Mark, moved to Nigeria in 2011 to manage the construction portion of the revitalization of a rural teaching hospital supported by Samaritan’s Purse in southwest Nigeria. The new laboratory is a marvelous site and another example of the miracles that are happening at the hospital. Never short on adventure around here, we really came down to the wire on getting the lab completed in time. But once again God pulled through for us. A company in Canada designed the interior lab layout. All of the equipment was shipped from the U.S. to Nigeria along with the cabinets, countertops, sinks, and faucets, but the container was delayed in the Lagos, Nigeria, port for more than two months. 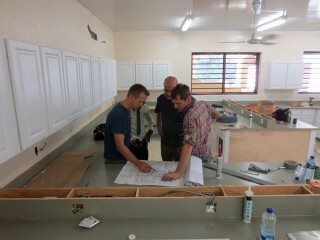 Mark Anderson was able to get all the cabinets installed in the laboratory in time for the equipment. We had a scheduled equipment installation with James from the Canadian company that couldn’t be rescheduled, so as soon as the container arrived, Mark began installing countertops. It was a rough couple of days of intense, long hours, but the first volunteer team of 2014 arrived with James and was able to complete the final punch list on Monday in time for the equipment installation on Tuesday. Phew! The old hospital lab was able to perform 20 tests; the new lab can perform more than 70. The community will now be able to receive testing that they otherwise would have to travel a minimum of three hours to receive. This new lab will save money for patients while bringing more funds for the hospital. Just this week, Mark was able to have blood work done that normally requires out-of-country travel. What a miracle and a living example of how this will directly benefit the community. For Mark’s test, the cost to travel and receive testing is about 10,000 naira ($70) total. Being able to stay in Egbe and receive testing now costs 4,000 naira ($25). Our new lab is set up and ready for testing even though it will not be officially open until the entire outpatient department opens. God is raining down blessings on this project and this hospital and this community like never before. We continue to thank Him for each miracle. 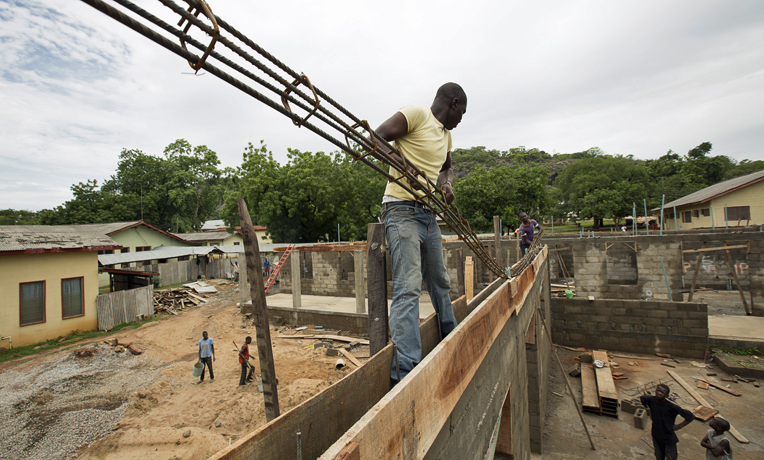 Samaritan's Purse helps to build communities by constructing houses, schools, hospitals, and churches. Our projects provide shelter for families who lost everything in disasters, education opportunities to help break the cycle of poverty, facilities for physical and spiritual healing, and places to build up the body of Christ.